Visiting a traditional Chinese doctor can go one of two ways. You will either have your tongue inspected, your pulse taken in six different ways and leave with a bundle of herbs to decoct at home, or you’ll find yourself gazing at the ceiling as acupuncture needles connected by a large battery twitch away in your forehead like crazed antennae. I jest – there are definitely more treatment options than that – but I’ve personally experienced both situations. 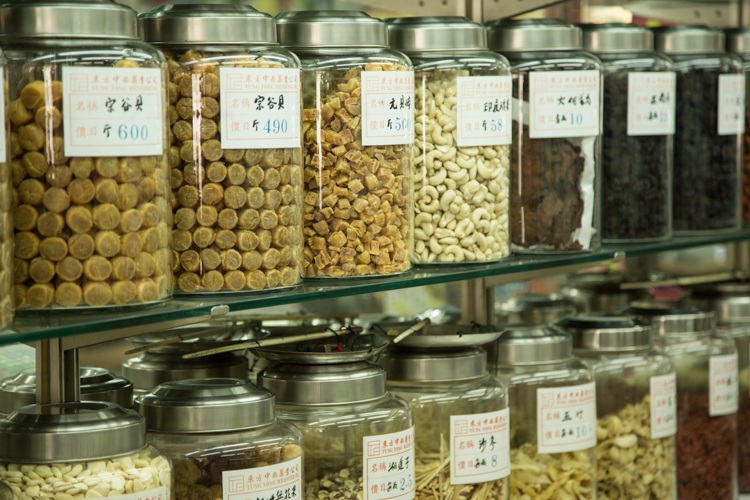 Traditional Chinese medicine (TCM) certainly subscribes to the view that the more bitter the medicine (or painful the treatment), the better it works. 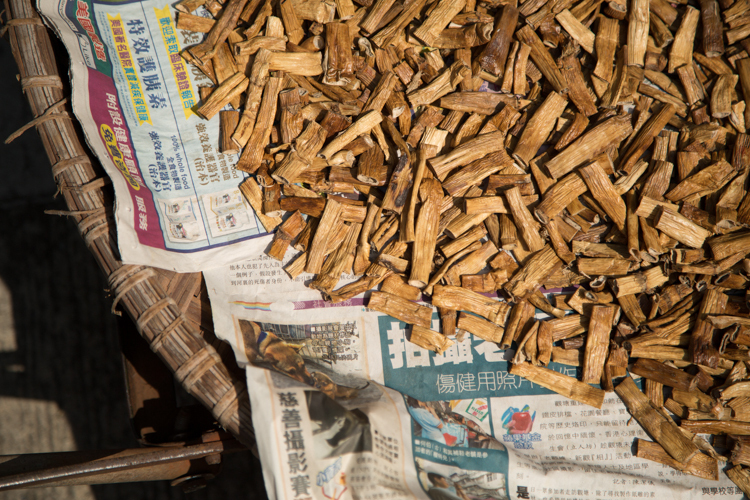 You will have heard of TCM’s herbal medicines (草药, cǎoyào) and acupuncture (针灸, zhēnjiǔ), but how about moxibustion (艾灸, aijiǔ), where smouldering mugwort leaves are pressed up against acupuncture points? Or gua sha (刮痧, guāshā), where the patient’s skin is scraped until it bruises or bleeds? Clearly not for the faint-hearted – even the innocuous-sounding herbal medicine is often incredibly bitter. Happily, Chinese food therapy – using food to improve health and prevent disease – is far more palatable. At its most basic, all foods are considered either yin (cooling) or yang (heating). The ideal for good health is to balance heating and cooling foods – when yin and yang slip out of balance, the result is illness or infection. Sometimes it’s easy to guess whether a food will be cooling or heating: Chilli pepper? Heating. Cucumber? Cooling, of course. But the designation is also frequently less intuitive – a steaming mug of green tea is cooling, while a slice of mango or a lychee is heating. I get terrible salad cravings in China, raw vegetables being a rarity in Chinese cuisine for the reasons outlined above. Luckily for me, there are a few exceptions; cucumbers smashed up with garlic or dipped whole into plum sauce, and the wonderfully-named, ‘Tiger Food’ (老虎菜, lǎohǔ cài); coriander, peppers and chillies tossed in sesame oil to make a fragrant, crunchy salad. 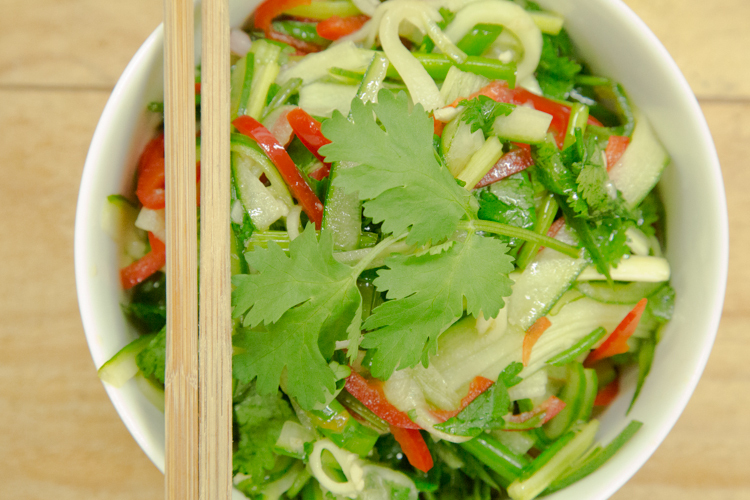 1) Wash and chop all the vegetables; julienne the cucumber and chilli pepper, roughly chop the coriander and spring onions into 1-inch long sections. * For a good explanation of TCM’s views on raw vs. cooked food, visit Straight Bamboo’s excellent site.